One the gripes I’ve had with the Apple “App” store is that it can be hard to search such a large index of applications to find what you’re looking for. Looks like it’s Google to the rescue as they seem to be adding (it’s still not perfect!) 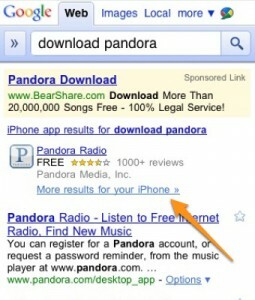 the ability to search the iPhone/iPad store as well as the Android store. Great news for both platforms. Not only does this addition benefit the consumer, this will make life easier for developers as well. Now there is a bit of method to the madness and the chances are higher of connecting developers and consumers together in app purchasing harmony!